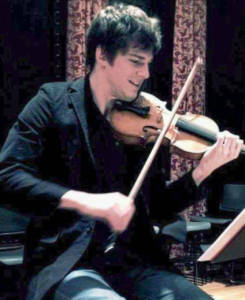 The Montclair Music Studio is proud to introduce Violin Instructor, Aubrey Holmes. Aubrey is currently accepting students on Thursdays & Saturdays. Aubrey has earned a BA from Dickinson College, an MM at The Boston Conservatory, and an MM at Kent State University. In the Boston and New England area, Mr. Holmes has played with MetroWest Opera, Symphony Pro Musica, Boston Opera Collaborative, The Cape Ann Symphony, Boston Modern Orchestra Project, The Vermont Symphony Orchestra, and The Cape Symphony Orchestra. He is currently a violinist in The Heimat Quartet which formed in 2014. The quartet is currently completing an Artist Diploma at the John J. Cali School of Music at Montclair State University under the tutelage of the Shanghai Quartet. Aubrey’s teaching experience includes terms with the faculty at Western Reserve Academy in Hudson, Ohio, Interlochen Center for the Arts and The Edward Devotion School in Brookline Mass.